The body of the stein is a smooth, black glazed, high quality stoneware decorated with a platinum wrap around design. 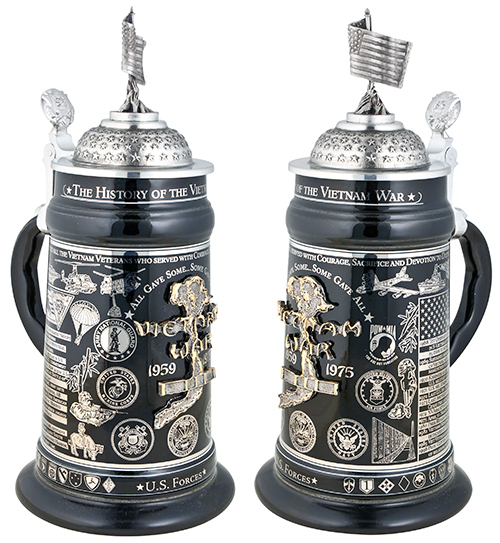 Crafted in tribute to those who fought in the Vietnam War this stein details the significant events of the war. The various emblems of all participating branches of the United States Armed Forces are represented. The sculpted lid figurine features a detailed pewter figurine of several hands holding a US Flag. Limited Edition of 5,000 pieces worldwide.